‘Looking Back; concludes its reflections of the Pickering Farm with a couple of more modern looks at the historic barn. 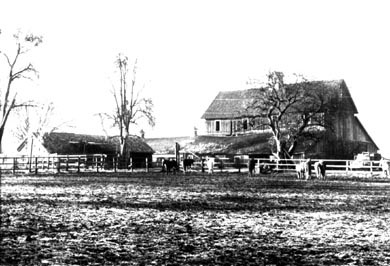 Above in a circa 1980 photo, the grain silos have been removed and the farm is operating as a horse stable. The garage building on the left and the hay and dairy barns remain. A 1955 International truck is shown at the right. A light dusting of snow confirms this is a winter picture. A more recent shot of the barn, taken in February 1999 is at the left [not shown on web site version]. Many aspects of the dairy barn have been restored, and the surrounding land awaits future development. Costco Wholesale, one of the primary tenants of the Pickering Place retail center is visible in the background at right.